The Vancouver Condo Buzz » From $349,900! Exciting New ADDITION Vancouver Condo Tower Previewing Now! 1 to 3 Bedroom Floor Plans Available! A new addition to the downtown Vancouver architectural scene is coming soon to Hornby & Helmcken! 164 homes priced from $349,900 will be coming soon to the Addition Vancouver condo tower that will rise 20 storeys. Brought to you through the collaborative effort of leading firms, the downtown Vancouver Addition Living condo tower is brought to the market by Kenstone Properties with modern architecture design by Henriquez Partners Architects and Marike Lainevool of Kodu Design. The contemporary brick and concrete façade, accented with perforated steel screens and C-shaped concrete fins are truly attractive. The Vancouver Addition condo building will also house an original 24’ by 22’ art mural, featuring a floating stair sculpture with integrated bench seating by Richard Henriquez himself. There’s also an impressive 25 foot structural glass lobby entrance with exterior wood soffits that extend indoors and cascade down to form a feature wall like no other. The sculptural living green screen in the courtyard will span 45’ and rise 3 storeys. The Addition Vancouver high-rise tower is situated in the heart of the downtown core, within walking distance to a number of top rated restaurants, coffee bistros, shopping, attractions and recreational pursuits. In addition, the project is situated adjacent to the historic Murray Hotel, just one block south of the Sheraton Wall Centre near the Burrard Street Bridge. Some of the highlights surrounding the central Vancouver downtown area where the Addition Condos are situated include nightlife options, vibrant entertainment, galleries and cultural centers. A few steps away are boutique retail stores, diverse dining options and easy access to all sorts of public transit routes. As well, nearby the Vancouver Addition condos for sale are bike routes, walking routes, parks, urban green spaces and some of the best beaches in town. 15 minutes away by walking (or 8 minutes by bus) is Pacific Centre Mall, Robson Street and the Vancouver Art Gallery too! Located at 1155 Hornby Street Vancouver, the Addition Condo Tower will be one of the landmark high-rises in what is becoming the most exclusive neighbourhood in the downtown area. 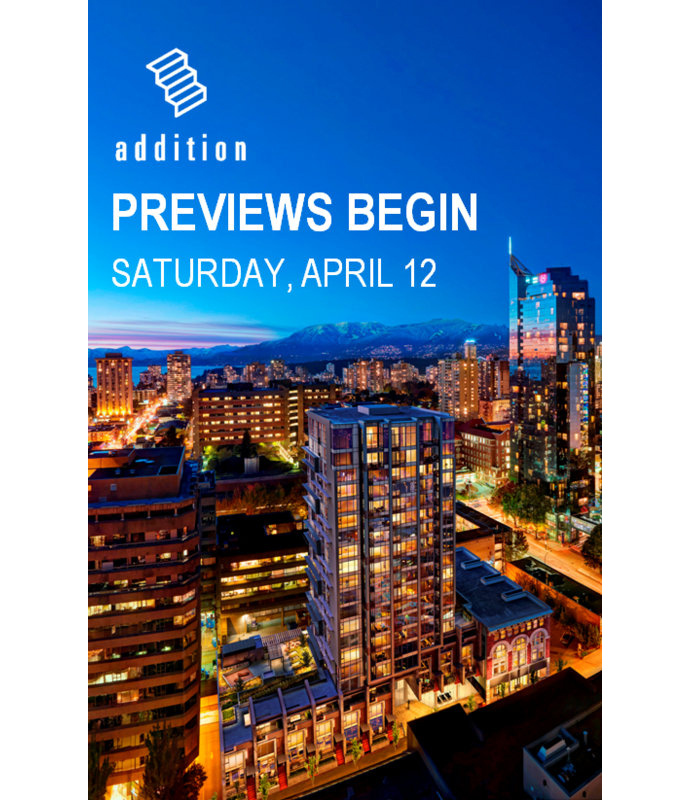 Get ready, get set, because previews are anticipated to begin early this Spring 2014 for this amaing 20 storey high-rise located at the gateway to downtown Vancouver’s dynamic Entertainment and Cultural Districts. Addition Vancouver Downtown Condos will bring only one hundred and sixty four homes priced from just $364,900, making them one of the best values in town. Situated at the corner of Hornby and Helmcken, the Downtown Vancouver Addition condos will give you great proximity to the Seawall, Stanley Park, Granville Island via the AquaBus, the Entertainment/Sports venues, Yaletown, Davie/Denman corridors and tonnes of shopping, dining, entertainment and transit routes. More information is online at: www.additionliving.com. 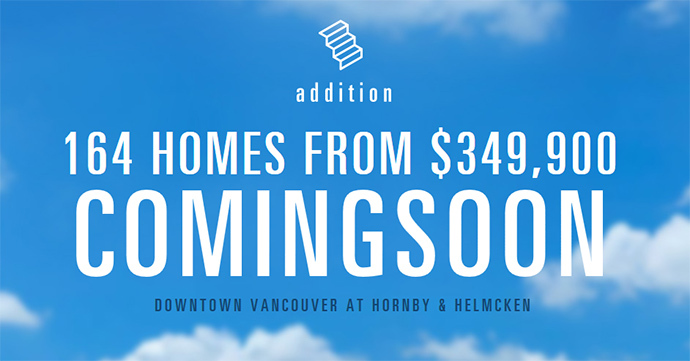 Welcome home to Addition at Hornby + Helmcken by Kenstone Properties. Located next door to downtown’s cultural, entertainment, and business hubs, this collection of 164 city homes (from studios to 3 bedrooms plans) is also steps from the city’s iconic parks and waterfront. The Addition Vancouver condo experience begins at the triple-height art mural lobby, and continues to all the exclusive interior details found nowhere else: custom cabinetry solutions by Friul Intagli of Italy, textured stainless steel countertops, wall-mounted kitchen faucet, brushed Ash laminate flooring, Porter&Charles appliance package, heating and cooling system from Belgium… Every home has been intelligently designed to maximize your livability. Some of the outstanding features that set the new Addition Vancouver tower apart from the rest includes the following: Smartforme building energy management system that allows for advanced in-suite metering technology and occupancy detecting thermostats in addition to the Clima Canal forced air heating, cooling and ventilation system. This creates a much healthier living environment for all owners. In addition, the new presale Vancouver Addition condos will feature a heat recovery ventilation system for fresh and continuous air circulation within your suite. The amenities on-site will include a courtyard patio area that is great for relaxing, entertaining friends and family or meeting. As well, there is an impressive double-height fully equipped fitness room that overlooks the courtyard. Outside, the new Addition Vancouver condo amenities will include a shaded outdoor BBQ patio with comfortable seating, fireplace, garden plots and even a children’s play area. The security in the building is also very good with key fob access to the underground parkade and all amenity areas. The elevators are locked off with restricted floor access and there is also a storage locker for bikes underground and optional storage lockers. All homes come with the 2/5/10 year Travelers Home Warranty. The interiors are carefully selected and designed by Kodu Design agency and will be both refined as well as modern. There is brushed ash laminate floors with thermo-acoustic underlay in most living spaces in addition to one hundred per cent wool 30oz loop carpeting in the bedrooms. The windows are oversized and they come with matching roller shades with no fascia panels. There is an ultra efficient washer and dryer by Blombert in addition to custom bedroom partition in select homes by Friul Intagli that has concealed cable chase for media, full height, white lacquered doors in soft touch and matte finishing, top track pocket sliding with soft close and integrated stainless steel finger pulls. The custom bedroom closet with integrated headboard in select homes is also by Friul Intagli design and will have full length LED strip lighting and over headboard linen storage. The kitchens at the presale Vancouver Addition condos for sale include custom cabinetry by Friul Intagli in 2 colour schmes that feature beautiful white lacquered doors in soft touch, surround panels with recessed finger pulls, pullout drawers with push button access, integrated pullout waste and recycling bins, under cabinetry lighting with LED strip, under mount steel cover to fully conceal the hood vent and removable kick-plates. The kitchens at the presale Vancouver Addition condos will also come with high performance stainless steel appliances by Porter & Chase, Liebherr and a Panasonic microwave. There’s even a Liebherr 24” bar fridge with glass door in select homes. The Addition Vancouver presales condos will also feature beautiful bathrooms with bathtub with inclined backrest, low flow dual flush toilet with soft closing seats, polished chrome faucets, porcelain tiled flooring and custom wall mounted vanities by Friul Intagli with acrylic resin sink basin, integrated toiletry holder, white lacquered cabinetry, soft closing drawers, and 6mm aluminum framed vanity mirror with top mounted LED lighting.